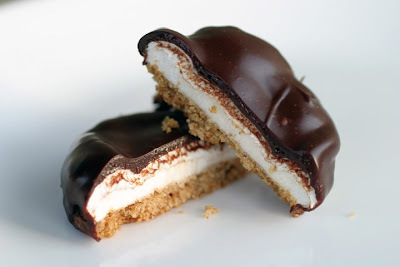 The Cooking Photographer: Smores Cookies, my Martha Stewart winning recipe. In May 2008 I was a grand prize winner in the Martha Stewart Cookie Contest and this cookie aired on her daytime show. In a large bowl whisk together all purpose flour, whole wheat flour, baking soda and salt. Set aside. Next, in a food processor cream together butter, light brown sugar granulated sugar and honey for about 30 seconds. Add vanilla extract and the egg and process until combined. Add the flour mixture and pulse until just combined. Transfer the batter to a bowl with a lid and refrigerate for an hour. Pre-heat oven to 350 degrees. Line three baking sheets with parchment paper. Roll the chilled dough to 1/8th inch thickness. With a cookie or biscuit cutter cut into about 2 inch rounds. Place on the cookie sheets and bake for 12 to 14 minutes until the cookies are lightly browned around the edges. Remove from the oven and immediately place a marshmallow on top of the cookie and put back into the oven for another 3 to 4 minutes until the marshmallow is soft but not melted. Wait about 3 minutes and spread out the marshmallows with your fingers. You will probably have to wash your hands a couple of times during this process. Move cookies to a cooling rack and allow to cool completely. Repeat with remaining cookies. Place a tea kettle of water to boil and set aside. Next, place the chopped chocolate in a food processor and process until fine. In a small sauce pan over low-heat warm the heavy cream, corn syrup, and honey until it comes to a simmer. Remove from heat, add the cream mixture to the chocolate, and process until smooth. Add water in small amounts as you need to make a slightly thin pourable chocolate. Put the chocolate in a deep small bowl. Dip each cookie and swirl until coated. Place on a wire rack to dry for several hours or overnight. Yummy, these look so delicious!I'm keeping this recipe! Could you tell me if you know any substitute for corn syrup? how many cookies you got out of this recipe? Try leaving the corn syrup out. I think it will work just fine. If I recall correctly this batch made around 30 to 35 (plus or minus). Your recipe was on Martha!?!?! How cool! They soud amazing! Bookmarked!!! Whoo-hoo - I'm so proud of you Laura!!! Just recently found your blog. I'm bookmarking a TON of recipes. I'm thinking of making this with some 7-minute frosting for the middle part and just piping it on the cookie. I think as long as it sticks tot he cookie, it would work just fine... Any thoughts?